I enjoyed having the U.S. 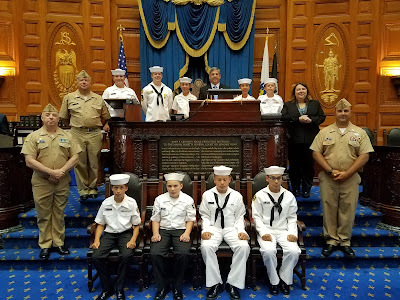 Naval Sea Cadet Corps - Gloucester Sea Cadets - David G. Ouellet Division visit the Senate as my guests so that they could receive special recognition for their service to others and their dedication and training to learn nautically oriented skills. The Sea Cadet Corps is dedicated to helping young people, ages 11 through 17, to develop into fine women and men. I thank them and their adult leaders for visiting with me and touring the State House as part of that engagement.